Best Strategy Contest: Share Your Opinion! Glad to see you on the Grace Continent! To complete tough tasks, compete for limited resources and defeat the evil Dragons, every tiny adjustment of hero formation, every equipment enhancing and every Divine Arma matter. Problems like how to level up in a short time, how to clear different realms with three stars can be a headache for players. Currently we are holding this Best Strategy Contest where everyone can share their strategy and possibly win awesome rewards! The quality strategy will also be posted in “Strategy” section in the official site and LoA3’s YouTube Channel (if it’s a video) where all players could see. 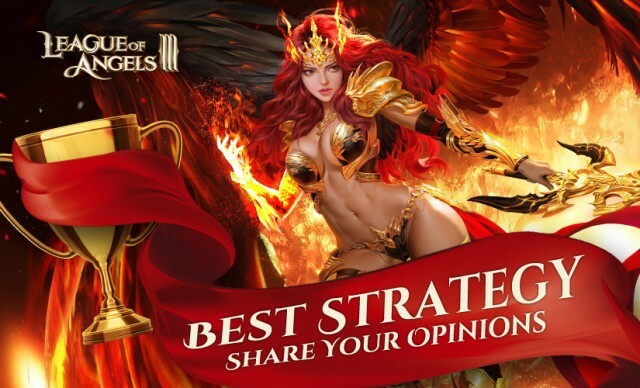 As long as you have unique opinions about League of Angels III, and are willing to help others, this will be the perfect place for you! Join us and share your strategy now! B. Gameplay (features): On different gameplay in game, i.e. Tree of Origin, Trial, Realm, Conquest, Mine Wars, Arena, World Boss, Guild Boss, etc. C. Resources: On how to obtain different resources in an efficient way, and how to make full use of them. D. Miscellaneous: For example, on how to level up in a short time, how to clear the stages with full stars, how to dominate, etc. E. Unlimited: Let your imagination run riot. Any strategy related to the game is acceptable, except the illegal ones. Last: Win Fabulous Outfits in Wheel of Fortune! Next: Winners of Arena Competition Have Surfaced!